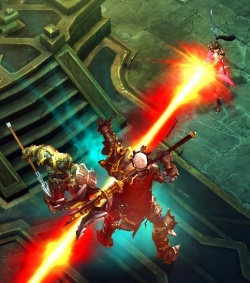 Disintegrate is a Secondary Wizard skill unlocked at Level 21, firing a laser beam of Arcane damage that moves instantly from the Wizard's hand to the edge of the screen. Its piercing ability and unrivaled speed are slightly offset by the fact that the Wizard is stuck in place while casting it. An earlier version of this skill had a much more complicated operation. For details, see: Disintegrate (July 2011). The best aspect of this skill is its speed and piercing ability. The instant the Wizard clicks the button, the laser beam stretches from her hand to the edge of the screen, hitting every monster in its path. This makes it very useful against distant enemies, as the beam can reach them long before they can advance, or even fire their own projectiles across the level. The drawback is a heavy resource cost and less damage than single target attacks. Note that a more powerful form of Disintegrate exists while in Archon form. A Wizard can call forth a death ray of Arcane energies to make matter simply vanish. Refer to the Disintegrate rune effects article for thorough descriptions of all five rune effects in this skill, including screenshots, videos, strategy tips, and other related information. Disintegrating Leoric while the Templar tanks. Disintegrate fires a red, ruler-straight laser beam of arcane damage, striking everything in a line AoE for a considerable distance away from the Wizard. The beam remains active as long as the mouse button is depressed (Arcane Power permitting). To aim it, move the mouse around and the Wizard will spin like a top, firing in whatever direction the mouse points her. The spell previously gained bonus damage to a single target with a longer lock on, but this feature seem to have been removed as of the beta test. Conversely, Disintegrate formerly did 20% less damage to each additional target, but this also seems to have been removed as of the beta. 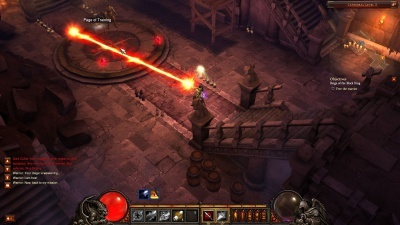 The skill is enormously effective against large groups of weak enemies, and can kill dozens or monsters in a blink as the player hoses the beam across the advancing hordes. It is less effective against larger enemies, and is ill-suited to killing big bosses since the damage is not high enough and the resource drain grows excessive. Disintegrate seems like an infinite weapon at first glance, but it is limited in range and speed, as players come to realize after experimenting with it a bit. The range goes to and past the edge of the visible screen in most instances, but it does not quite reach the diagonal corners. You see it falling far short of the edge in the screenshot to the right, but that is somewhat misleading, since the steep stairway in that image forced the "camera" to remain up higher, giving a longer view than you normally see in the game. A video of Disintegrate can be seen below, courtesy of the DiabloInc You Tube channel. That’s one of the most interesting things about using Disintegrate; that it’s more effective if you’re not moving. But Wizards seldom have that luxury, at least not when they’re playing alone. A solo wizard is a hit and run machine, throwing magical projectiles, rushing back or to the sides to dodge returned fire, darting in to land a few Spectral Blade strikes, etc. Disintegrate looks like it’ll be very useful against weak, ranged attackers, or else will be best used in a multiplayer game, when some other character is up front tanking, giving the Wizard the freedom to pour this one on non-stop. It was slightly changed in the BlizzCon 2009 demo, where it received a small boost in damage and mana cost. It was also boosted up to Tier IV, unfortunately putting it out of reach of players. Very useful blasting, instant speed to the edge of the level, but it requires a clear line or sight, and it holds the Wizard in place while using it. Smart Wizards I saw used it a lot, but in bursts. Any time they had a clear shot they’d cook someone from a distance, ideally over one of the openings in the ground. The damage per second wasn’t huge, but it added up and was very easy to hit with. 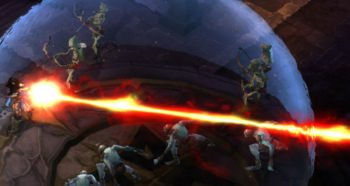 Skill tiers were removed for the July 2011 Press Event, allowing skills to unlock steadily from levels 1 to 30. Consequently, all skill levels were adjusted and Disintegrate became a level 12 skill. As fast as the spell moves, it can feel slow to target, at least compared to Electrocute, since the beam only goes right where you point it. Electrocute jumps between targets, so if you click a spot in the middle of a pack, it will hit everything in an instant, without you even moving the mouse. Disintegrate doesn’t do that, so you have to move the cursor to move the beam, and that can feel ponderous. Your character pivots in place, and while you can rotate pretty quickly, it’s slow enough to feel slightly realistic, like you’re actually turning and moving, not just flipping instantly from left to right. With the Beta Patch 8 of December 2011, Disintegrate was dropped to level 8. With the Patch 13 changes, it was classified as a Secondary skill and bumped all the way up to level 20, out of reach of beta players. With March's Beta Patch 14, it was moved to level 21 and its damage slightly reduced. See the Wizard skill archive for more details on previous versions of Disintegrate and other Wizard skills. Or see Disintegrate (BlizzCon 2008) for the original version of this skill. Or see Disintegrate (July 2011) for a more recent version of this skill. 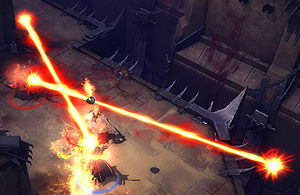 With Diablo III, Blizzard have looked more at the traditional Dungeons & Dragons pen & paper RPG for inspiration. The Disintegrate spell is one of the "trademark" D&D spells, which name is likely taken in tribute to the pen & paper RPG. Disintegrate used in a Slow Time bubble. Disintegrate used on a Skeleton. Disintegrate in character artwork by Blizzard artist Josh Tallman. This page was last edited on 8 June 2012, at 05:44.